I am finally back at work today. That “cold from hell” turned out to be the flu. I was out for a whole week and it really sucked. My diet consisted of soup, McDonald’s, soup, rice, tofu, cucumbers, and soup. We were finally better on Saturday and SO ready for real taste in our mouths that we had to go to Panda’s and get orange chicken to put some zing back in our taste buds. Last night I had Zippy’s chili as that was another tasty yum to help bring back the feeling to my mouth again. I was too busy with meetings all day to post this, but I had furikake wasabi salmon. Grandma J had given this to us earlier in the week but I just didn’t have the appetite to eat it. I added in some mixed tomatoes and put French dressing into the little Hello Kitty container. Friday Mr. Pikko went to work and actually brought me home Gina’s Korean Miso Soup, which I had been craving but couldn’t have due to them closing down their Waipahu location. *sob* I felt so gross and uncivilized after being at home for a week that I actually moved my take-out miso soup and veggies to the nicest dishes I had and ate them off that, just to feel normal again. Anyway, hopefully I’m back to normal. I won’t have a bento tomorrow as I’m going to a work assembly. It’s 5:30 PM, I’d post more, but I want to go home! Yay, and a Happy Boy’s Day to you too! 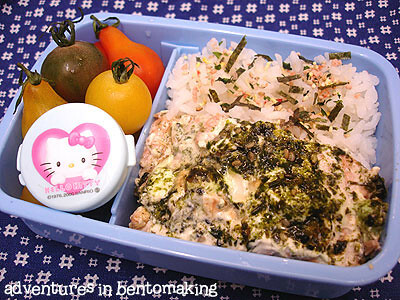 Glad you’re feeling better, here come the bentos again! And they closed that Gina’s?!? Where am I gonna eat whenever I go to Suzies now? Bummer.